The Trump presidential campaign used the data gathered from Facebook through 2016 to build ad-targeting profiles on potential voters. The attorneys general demanded Zuckerberg answer questions including what type of controls Facebook had over data obtained by Cambridge Analytica or others and whether Facebook had protective safeguards in place, including audits, to ensure a Facebook user’s data is not misused. 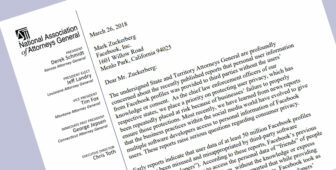 Zuckerberg also was asked how many Facebook users have been affected in each state that’s home to a signer of the letter. Zuckerberg said Facebook has taken the necessary steps to prevent similar incidents from happening again. But that hasn’t satisfied Jepsen, and many of Facebook’s users and investors. The Jepsen-led campaign turns up the heat on Facebook, which is facing a Federal Trade Commission probe and investigations by the U.S. House of Representatives and Senate over the Cambridge Analytica matter. Jepsen said his involvement in the Facebook issue is not political, but born of the need to protect consumers and their privacy. He spoke with the Connecticut Mirror about what he hoped to find out from Facebook and how the explosion of social media poses unforeseen consumer protection threats. 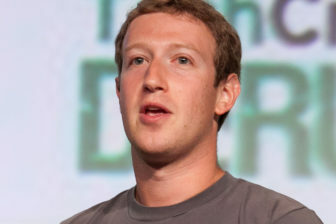 Why were you so fast to jump on the Facebook issue and decide Zuckerberg needed to answer some questions? Connecticut has a strong tradition on data privacy. Connecticut is very, very active on data privacy issues. When I came into office, I was surprised at the number of data breaches I was asked to investigate, so I created a working group, a task force that reached across disciplines because data breaches can be medical, they could be consumer-oriented, they could be banks, they could be stores, and eventually I created the first data privacy, data security office of any attorney general in the country. 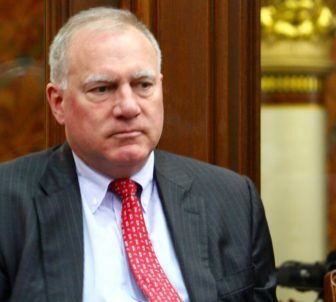 Along the way Connecticut — and sometimes we are joined by Illinois and sometimes Pennsylvania — has emerged as leading these large, multi-part, multi-stage investigations. So whether it’s Target, Anthem/Blue Cross, Home Depot, Sony and most recently Equifax, which was the mother of all data breaches, Connecticut has had a national leadership role. So you think the Facebook incident is a data breach? We’re still trying to figure out if it was a data breach or misuse of information that was legally acquired. We’re not jumping to any conclusions, but the fact remains that the data on 50 million people was, in fact, compromised. So it made sense for Connecticut to step up with other states. The genesis of the letter that was signed now by 39 states is… Democratic AG’s have a weekly call where we compare notes on what we’re working on, and the issue of Facebook naturally came up, and I suggested to the group that this was an issue that should be handled in a bipartisan way. So, we reached out to some of our Republican colleagues with whom we have a very positive relationship. They immediately saw the consumer protection connection. We are not focusing on the Cambridge Analytica issue, we’re concerned with the consumer protection aspect of it. Are you confident Zuckerberg, or anyone at Facebook, will answer your questions in a timely matter? Congressional hearings can be a circus. I’m not interested in a circus. I am interested in getting information about the issues at hand, which are ‘How did this happen?’ They said they would use the (Facebook) data strictly for academic research… we want to flush that out. Does Facebook police its own policies? And we want to make sure this kind of thing never happens again. I am concerned about the accuracy of the information. I am not concerned about how it is communicated. And your investigation is limited to the consumer impact of the use, or misuse, of Facebook data? Our job is to protect consumers. Elections and that stuff surrounding Cambridge Analytica is of interest to Americans and to the world. But that’s not in our wheelhouse. Our wheelhouse it to protect consumers. There are questions for which there are apparent answers. But the nature of a thorough inquiry is that we don’t take the representation of it as true or valid, we have to investigate thoroughly until we are persuaded that the information that is provided at first blush or first response is true and valid. What’s great about state attorneys general is that we are very nimble, we can respond very quickly. We are right at the core of our mission because we are enforcing state laws that protect consumers. And there is strength in numbers…. The advantage of creating a multi-state, bipartisan coalition is twofold. One is we can bring more resources to bear than a single office could do. And secondly is that I know from previous issues arising from Facebook over the seven-plus years of my tenure that they understand the value of a multi-state coalition so that they are not responding to 39 different individual state inquiries. This isn’t the first time that my office has interfaced with Facebook, and they know that we are not there to exploit this for cheap publicity. They know we are out there to try to solve a problem. What was your first experience with Facebook? A state representative, I don’t remember her name, contacted my office and said that a fake Facebook page had been put up under her name making solicitations, you know ‘my nephew is in trouble,’ so it was transparently a false page. And she ran into a lot of roadblocks within Facebook in getting the page taken down. Something that should have taken an hour or two took about 12 hours or two days, something like that. So, we reached out to Facebook and discussed the issue, and they changed their processes and protocols for when something like that occurs. It’s now much easier to get clearly false pages down. These companies have discovered we’re interested in solving problems rather than generating any ‘gotcha’ politics. When do you think you might get answers from Facebook? I couldn’t speculate. I would rather them get it right and take extra days or weeks than rush it. Yet it’s clear the attorneys general have turned up the heat on Facebook. That’s part of the minuet. They need to understand that this issue is not going away.